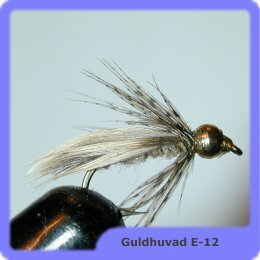 An article we got published in the Swedish fly-fishing magazine Flugfiske i Norden (translates to something like; Flyfishing in Scandinavia) more then 15 years ago started like this (here translated of course): "Européa 12 (or E-12 that is the popular short name for the fly) is one of our most popular caddis immitations, mainly famouse for attracting grayling. 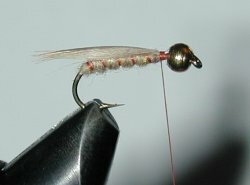 What is then more natural than trying to use the fly's successful basic theme in other caddis immitations - creating new dry flies as well as new wet flies..."
We experimented a lot back then, and the GHE-12 is one of the very few creations that always holds a secured place in the fly-box - this article is about that fly. 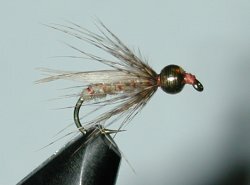 "Lennart Bergqvist (sic: a very famous Swedish fly tier in the eighties and nineties - famous in Sweden at least) has also introduced the diving caddis fly, which imitates a caddis on its way down to the bottom of the stream to lay their eggs. 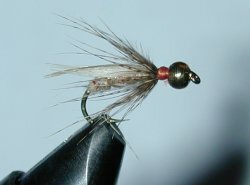 Lennart ties a variation with the e-12 as a starting point, but he exchanges the hackle with a soft partridge hackle, and ends up a with a Fly-Rite part. The fly is fished up-stream, and a lead ball 75 centimeters up on the leader gets it down close to the bottom. 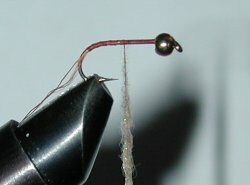 Gunnar Westrin (sic: a famous Swedish fishing writer) once finished one of his lectures by mentioning that he was going to try to tie, and fish, an e-12 with a gold head. 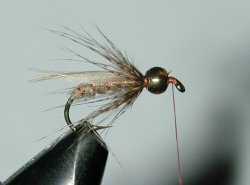 We don't know how he really imagined that fly's appearance in general, but his idea formed the basis for a variant which is also based on, and has borrowed elements from, Lennart Bergqvist's diving caddis. The result is that you do not have to tangle with the lead ball on the leader. The method thus becomes easier, although a non-weight fly with the led ball on the leader moves differently in the water than if the fly itself gives the weigth... That our own combination of Gunnar Westrin's and Lennart Bergqvist's idea works perfectly we found out during that summers mountain fishing trip - the new variation became something of an all-round favorite as soon as the fish did not rise for our floating Européa variants." A lot of water has passed under the bridge since then, but the GHE-12 is still as hot as allways. 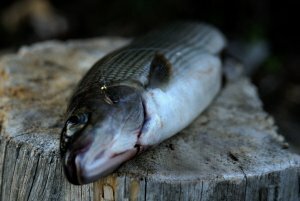 It has proven to deliver in more or less all grayling waters it has been tried in, but maybe it feels most at home at Stora Harrträsk - a grayling lake where fly trolling is the most efficient method for catching fish, and here GHE-12 are one of the dominant flies over the years. Our first version was tied with a yellow thread, and that are nowadays switched to brown, but apart from that our original pattern are still the same - different variations simply have not proven to beat the original. 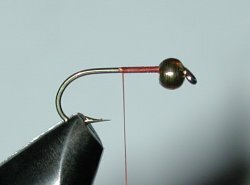 It seems that the pattern is more important than the size - a classic wetfly hook of size 12 is what we most often use, but a size 10, 14 or 16 is also viable. 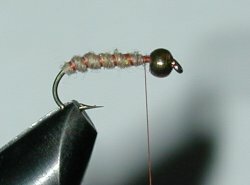 You can fish the fly on a czech nymph tackle, as a part of a classic wet fly tackle or any other way you can think of (but not as dry of course) and it will give you great chanses to catch your grayling of a lifetime! - Gold head. 3 mm is the correct size. Wrap the thread a little bit down on the hook eye. Make a loop of the thread fix in the back - this will later be acting as the rib. Then go forward with the thread and attatch the dubbing. As wing, tie in a breast feather from mallard, sedge-style. Add a drop of varnish on the thread and push back the gold head. Then fix the thread again, this time in front of the golden head. Tie a head in front of the golden head to fix it. Finish with a few knots and do not forget the varnish.